properties to optimize its overall efficiency. The Metallic Panels being Absorbing Type offer high efficiency not only in Noise Isolation but also in actual Noise Reduction in the adjoining environment where it is installed. Providing a highly efficient and cost effective product with a long life cycle. Available in both Steel and Aluminium it can be utilized on various locations including bridges, boundary walls, direct on ground etc..
AC-100, AL-100, ALX-160 Steel or Aluminum Metallic Acoustic Panel. 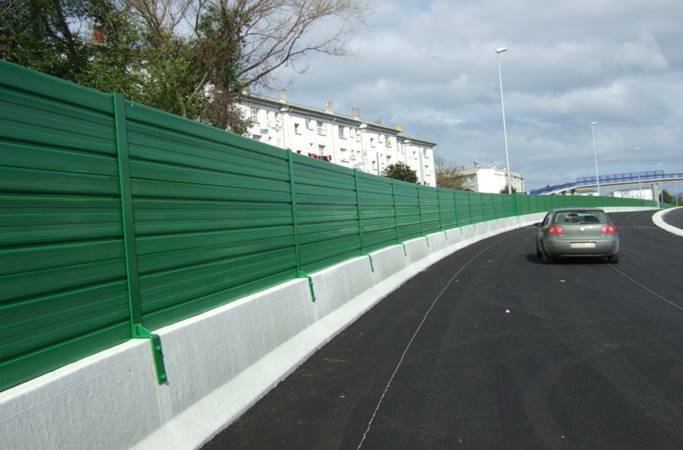 The noise barrier can be made of grade IS 277 galvanized steel plating or with AA 3105 H24 aluminium sheet, either of which has a powder coating finish, customised as required in any shade on the RAL colour chart. The inside of the composite panel is made up of sound-absorbing mineral wool of various densities and thickness depending on the precise noise-abatement properties required. Thus, panels comprise four metal parts. face is a plain, reflective panel. Barrier panels are installed between vertically arranged HEB/HEA profiles to achieve the desired overall height, in 300, 400 or 500 mm modules, and the distance between posts can be varied.